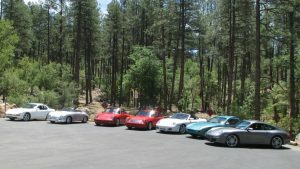 Our friends in the Arizona Mountain Region have invited AZPCA members to join them in cool Prescott for a picnic at Goldwater Lake. 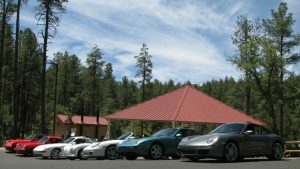 We will meet in North Phoenix on Sunday morning and take the fun route up to Prescott. In late September the temperature in Phoenix can still be over 100 degrees while Prescott is in the 70’s! What could be better than a picnic at one of Prescott’s forest lakes? How about great driving roads? How about only $15 for lunch? The drive will depart the Valley at 9 AM from the First Watch restaurant at 34948 N. North Valley Parkway, just north of Carefree Highway on the NE corner of I-17 and Carefree Highway (Highway 74). The route will be through Wickenburg, Yarnell, White Spar Road and ending at beautiful Goldwater Lake. We’ll have a quiet ramada set up with lunch catered by Panera Bread Company! Please register on MotorsportReg.com below no later than Tuesday, September 18th so we can plan for sufficient food. Capacity is limited and last year the event sold out early! The drive will leave promptly at 9 AM so be at the departure point on time!